Peruse the luscious rolling meadows and stumble across Piggy farm, the farm where the grass is green and the pigs are clean. This farmyard themed slot online 5 reel has an enormous 25 pay lines for you to get your teeth into and entertain yourself with the cartoon style pig, rooster and windmill symbols in this online slot game. This online game simply doesn't compare to that little piggy bank that sits on your table, after playing piggy payout you'll need more than one of our miniature money filled friends to contain these cash prizes! Eyecon began its journey in 1997, witnessing the birth of the online casino which revolutionised the way we have been gambling ever since. This Australian based developer has more than 100 online slot games in its library, each designed to a high standard with immersive gameplay and stunning 2D and 3D graphics and animations. They also have other games including live casino classics and bingo titles, but it’s online slot games where their passion lies. The full range of Eyecon games is available on slot online games. Take a trip to the countryside and visit the farm to see some cute animals with Piggy Payout. 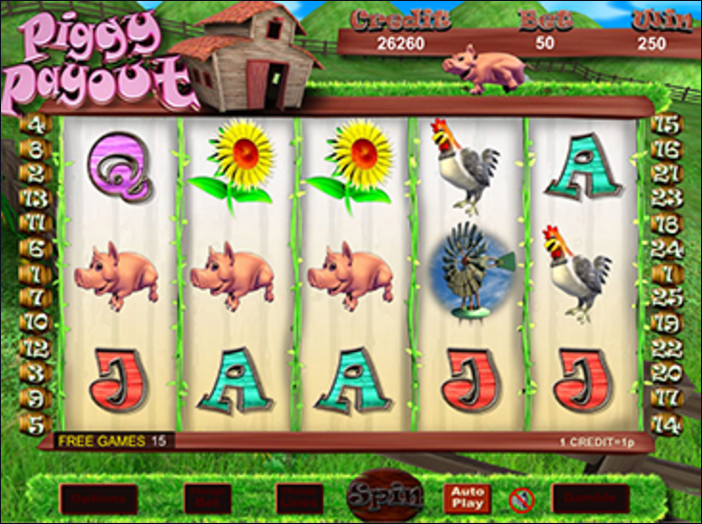 This fun, farm-themed online slot game comes with 5 reels and 25 pay lines. You can join in on the fun from as little as 1p to £50p per spin as the pay lines and coin values are fully adjustable, ensuring that any player with any budget can have a good time in the countryside. The game is set against a rich green meadow backdrop, with small green hills, a clear blue sky and a dainty little barn. You have your traditional card value symbols of J, Q, K and A, as they are the most common to appear they are the lowest in value. You also have a Cow, a Dog, a Chicken, a Sunflower and Sweetcorn as your higher value symbols. The Wild symbol is the Wind Vane symbol, not only will it substitute for all other symbols except the Pig and Sheep Scatter symbols to help you form winning combinations, but if it helps you form a winning combination it will double your prize! If you land 3 or more of the Sheep Scatter symbols anywhere on the reels you will trigger the Prize Pick feature. You get the same number of Picks as Sheep Scatter symbols that have landed on the reels, each prize comes with multiplier prizes up to 100x times your total bet. 3 or more Pig Scatters anywhere on the reels will activate the Free Spins feature. 3 Pig Scatters will reward you with 15 Free Spins, 4 will give you 20 Free Spins and 5 will trigger 25 Free Spins. All of your winnings during the Free Spins round are double, and you can retrigger more Free Spins up to a maximum of 15 times but landing more Pig Scatters on the reels during the feature. After every winning spin, you can play the Gamble Feature. This is a double or nothing game, based on the prize of your last winning spin. If you choose to play you are dealt a card, you can guess the colour to double your winnings or pick the suit to quadruple your winnings. Choose the wrong colour or suit and you forfeit your winning bet. Get a free spins if you use mobile slot deposit today. Piggy Payout is too cute for words, you’ll love the silly animals that feature on the reels as they bring you cash prizes and winnings. You have multiple bonus games to play with too, which adds to the excitement of this fun game, and the betting range will appeal to every type of player out there. Now check out our Gonzos Quest Slots or find more Easy Slots games.